If you are looking for something unique and different then you need to take a closer look at this stunning ring. The Personalized Birthstone Cuff Bangle Bracelet with Heart CZ Stones is an amazing piece that features a snap on design for quick an easy removal and comfort. The bracelet can be customized with two names, each one engraved on either side of the heart and gemstone. Only the finest in sterling silver is used in the bracelet and the cut of the bracelet makes it easier to wear without having to worry about sizing. Give a truly unique and personalized gift and show that special someone in your life- or yourself- just how great they really are! Names can be up to 15 characters long and includes numbers and keyboard symbols. 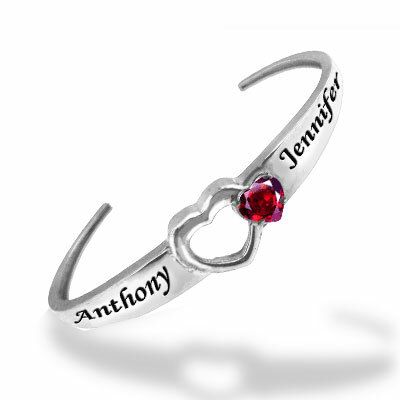 We guarantee our Personalized Birthstone Cuff Bangle Bracelet with Heart CZ, Sterling Silver to be high quality, authentic jewelry, as described above.